Mr. A & Mr. B. This newsletter is a little bit later than the autumn issue usually is; the stories - a book, actually - that accompany the prints in the new My Solitudes series take up such a huge amount of time for Sadako and myself, that it's difficult to make time for 'extras' like this newsletter. Do you remember that I told you last time about friend Doi-san's exhibition? It turned out very well, and we'll have a short report on it here. Most of the rest of the issue is taken up by a discussion of how my work has changed now that I am designing my own prints instead of making reproductions. We'll wrap things up with Sadako's Corner, but don't miss the page that introduces this year's special Gift Print! After 18 years of producing woodblock prints based on designs of other people - making reproductions - this year I have started making prints of my own design. As you might expect, this switch has had some major ramifications in the way I work. Everything is still the same ... 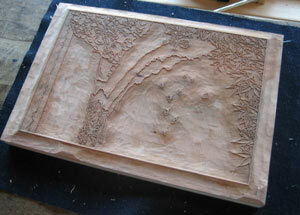 I spend my days carving and printing ... but yet, everything is different! During the years that I was making reproductions, my work was primarily 'technical'. For each new print I made, I referred to a 'master copy' as a guide for my work. I didn't have to think about what to do, but simply how to do it. See that line, carve it. See that colour, print it. Now that's a bit of an exaggeration, because there are actually many artistic aspects to reproductive work; the lines must be carved with good 'sense' and the colours mixed using careful judgement. It's definitely not a job for a robot! But because the designs were fixed, the work did proceed along mostly technical lines. Now however, with each print being created completely from a blank 'canvas', everything has changed. There are no more lines for me to copy, no more colours for me to re-create in my mixing bowls, no more restrictions ... anything is possible! And not only is anything possible, but anything is correct! If I - the 'creator' - decide that a particular blue colour is to go in a particular place on the print, nobody can disagree with me. But this total freedom brings with it a huge difficulty - with no more rules in place, then how on earth am I to decide what is 'good'? Because I am making relatively realistic prints, not abstracts, one answer to this question is to compare the image on the paper to the actual scene; does this tree look like the 'real' tree, this mountain like the 'real' mountain? But if close fidelity were the goal, then photography would be a better method to use. No, in a woodblock print the tree has to look something like a tree, but not too much like one, and finding this balance is indeed turning out to be not very easy for me. The difficulty comes from a fundamental question of personality. Let's step back a minute, and imagine two people: Mr. A and Mr. B. Give Mr. A a sheet of paper and a stub of pencil; by making a few scribbled lines here and there, right in front of our eyes he can create something recognizable ... and interesting! Mr. B though, works in a different way, he wants to plan everything first; he will sit and think about what to do, and then carefully make preparations for the job, which he may do over quite a long period of time. The resulting work may be just as interesting, but the route to get there is quite different. 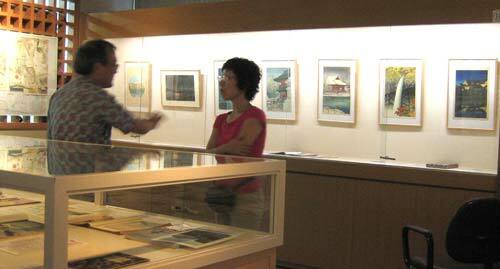 Now back in the 'old days', Japanese prints were of course created by the combined efforts of different people. 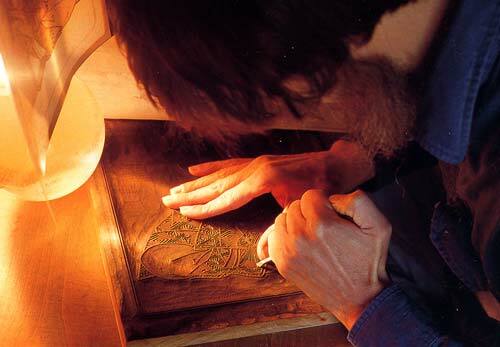 It's not too difficult to imagine Mr. A as a designer sketching the images, and Mr. B as the carvers and printers sitting and producing hundreds of copies of the design. Each person does the job to which he is best suited. When the 20th century came along, the world of Japanese prints changed radically. A new movement arose based on concepts imported from the west, called sosaku hanga (creative printmaking), where one person was required to do all the steps himself, from creation of the image, through carving and then onto the printing of the final work. 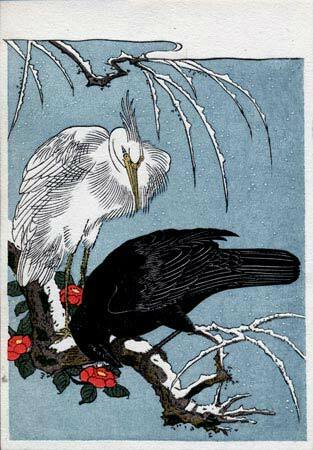 But of course, the Mr. A type of person - the ones eager to create the images - never have the personality to carefully produce the prints, so work of this type is very roughly made, and in small irregular editions; perhaps the most famous example is Munakata Shiko. His work is of course widely viewed as wonderful 'art', but - from the point of view of someone like myself - the prints are not 'well made'. In a nutshell then - the man with the raw creative energy can never discipline himself to the extent necessary to produce multiple copies of highly-crafted prints, while on the other hand, the man who has the patience and discipline to produce finely made work is not likely to also have the 'creative spark'. It's next-to-impossible to find both characteristics in one person. But where do I now fit into all this? For the previous couple of decades, my position was clear - I was Mr. B, carefully creating detailed reproductions of old prints, in a well-organized and controlled structure. 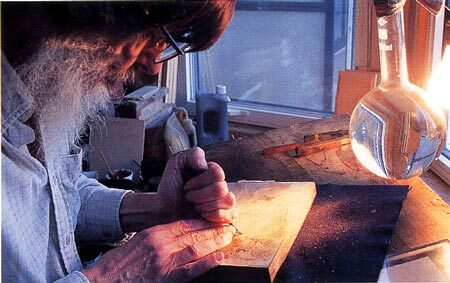 I said to anybody who would listen, "I am not an artist, I am a craftsman!" Here I am though, taking on the job of producing a series of originals, with the intention of creating finely made and finely designed prints - Mr. B and Mr. A trying to live together in one head. Mr. A: There, here's the sketch for the group of trees. Mr. B: What have you done? That tree gets fatter towards the top; trees don't do that! Mr. A: I'm the artist; I'll draw it the way I want it. Mr. B: It looks strange! Mr. A: What are you doing with the texture on that tree? You're carving every tiny indentation of the bark! We don't need all that detail! Mr. B: But it looks really neat! Mr. A: It's too realistic, and it'll take too many days to carve; get rid of it! The battles between the two of them never cease. Does this mean then, that the prints I will make for this series are doomed to be a 'mish-mash' of disparate styles, neither one thing, nor the other? I think not. For one thing, my character is most definitely not a 50/50 balance of A and B; I am very far over on the B-side, so without question, my prints will reflect that. They are going to be quite 'realistic', carefully crafted, thoroughly calculated, and generally quiet in aspect. Because I am weaker on the A-side, the prints may be thought to lack originality, but I think I have an ace up my sleeve. And that ace is the inherent beauty of prints that are made using the traditional Japanese materials and techniques. These bring so much natural beauty to a print that it is actually difficult to create something 'bad'! When discussing these topics with people I sometimes make the claim, "If a man is a good printer, you can give him nothing more than a blank piece of wood - nothing carved at all - and he can made an attractive print from it! ", and I think that is true. A smooth tone here, a touch of gradation there, a colour overlay here ... and a few minutes later we would see a beautiful 'image' developing. Without any input from the A-side at all, the B-side can create beautiful objects! And that is my goal - the creation of beautiful objects. I harbour no illusions at all that what I am making is 'great art', but I do most sincerely hope that it is beautiful - and by that I mean that it is interesting and attractive to look at. 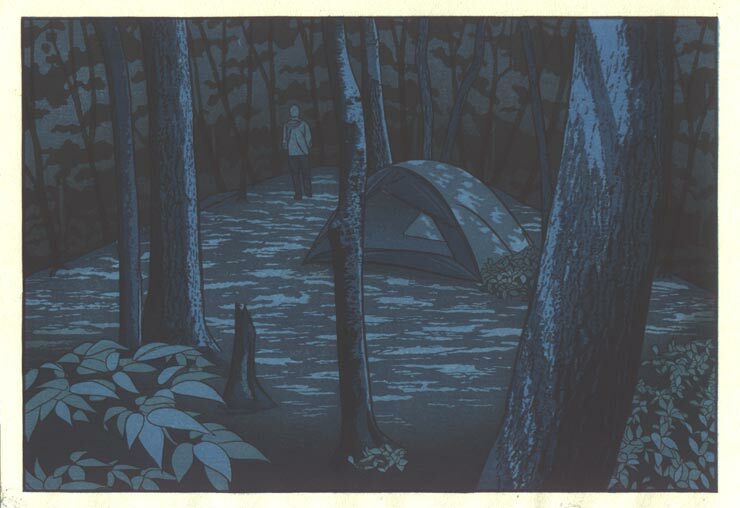 "The tall trees looming over the figure and tent and the viewer create the sense of uncertainty and awe that is usually present at night in the forest." This is certainly an appreciative comment, but I have to admit that when designing that print, I had no intention to try and produce such feelings in the mind of the viewer. I put tall trees in the print because there were tall trees at that spot. This doesn't mean that I am rejecting this comment; it simply points out that these objects are complex, and can be viewed and appreciated in many ways. 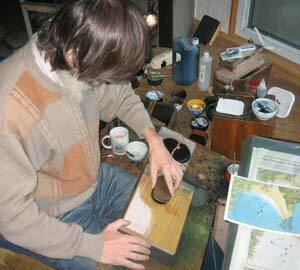 As I write this story for the newsletter, I am involved in test printing of the third image in the series. Each morning when I head down to the workshop to begin the day's work, I open the door with some trepidation. The completely 'peaceful' mood that has filled this room in recent years has now changed, and there is a different atmosphere. It would be an exaggeration to say that my hands are shaking as I sit down to work, but that is not far wrong. This new project is one of the most difficult jobs I have ever undertaken, and it is certainly not a foregone conclusion that I will be able to complete it satisfactorily. I think that the first two prints were reasonably successful, although neither of them lived up to the image I had in mind. Thank you for your support; it should be an interesting ride for all of us! 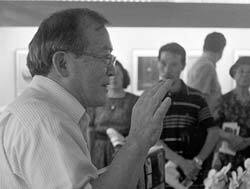 Just over three years ago - in the summer of 2004 - the 'Collector Profile' corner in this newsletter featured Mr. Toshikazu Doi, a long-time supporter of my work. I mentioned in the previous issue that he would be holding an exhibition of prints from his collection, and can now report that it was a wonderful show! In that earlier profile story I focussed on Doi-san's collection of senjafuda (small label-like prints), but his main print interest is in the shin-hanga genre. 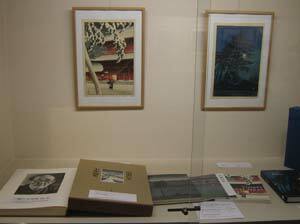 These are prints made in the first half of the 20th century, but which followed the traditional 'division of labour' system in their production, just like the old ukiyo-e. A publisher directed the entire process, working with designers, carvers and printers in the creation of the editions. Doi-san has an extensive collection of shin-hanga, but this exhibition was devoted to an overview of the work of one artist in particular, the famous Kawase Hasui. Hasui passed away in 1957, and this 50th anniversary was the particular reason that Doi-san decided to have this exhibition now. It was held in a small private museum in Bunkyo-ku, the Koishikawa Ukiyo-e Museum; he is a member of their print study circle, which meets monthly to discuss esoteric points of traditional Japanese prints, and was thus able to arrange to use their premises. This museum may not be the most well-known in Tokyo, but the facilities are excellent, and Doi-san was able to mount a beautiful show. For this show he selected prints representing most of the stages of Hasui's print design career, but the emphasis was on the early work dating from before the Tokyo earthquake. These prints were produced by the publisher Watanabe, and partly due to their rarity, but mostly due to their excellent quality, are eagerly sought by collectors of the genre. Doi-san explained to us during one of the Gallery Talks that it is now becoming very difficult for him to obtain additions to his collection, as prices are climbing all the time; he wishes he had started many years earlier! I think that probably most of the people who visited this exhibition came to see the 'attractive' pictures on display. There is nothing wrong with that, as of course these prints are indeed beautiful to look at, but those of us with extensive experience of prints can see more than this, and can understand just how well Doi-san made his selection. On one of my visits to the exhibition, I had a chance to closely study the prints on display together with Shingo Ueda, a young print craftsman who has done some work for my Mokuhankan project, and the two of us marvelled at the quality of the printing work we saw. We may tell ourselves, "The paper back then was so wonderful! All the supplies were of such high quality! ", but in reality the main difference between these beautiful old prints and the ones we produce mostly comes down to the skill of the men who made them. Doi-san understands these things, and seeks out only the finest examples of the printer's art to add to his collection. Every single print on display was a magnificent specimen! Both Ueda-san and I aspire to create prints of this level of accomplishment, although we sometimes despair of ever being able to do so. But knowing that there are such collectors as Doi-san - people with an eye just as keen as our own - is a strong motivation to keep us working towards that goal. Doi-san, thank you for a wonderful show; I learned a great deal from it! Last year, in the runup to the year-end holiday season, I prepared a special 'Gift Print' package, and made it available through my online Mokuhankan shop. I used the blocks from one of my older new year card prints, and created an attractive item consisting of the mounted print, an explanatory sheet, and a gift-wrapped package, ready for presentation. It was quite successful, and I think it should be an annual tradition, so I have prepared a similar item again this year, using as an original a kacho-e design by Isoda Koryusai. The packages are a flat price - $30 - and include airmail postage anywhere in the world. I can mail either to you, or directly to a recipient of your choice, with a note inside letting them know who the gift is coming from. 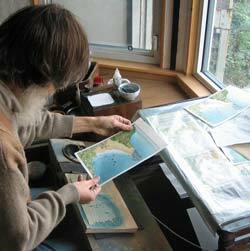 It's an attractive little item, and a great way to introduce somebody to the pleasure of hand-made prints. I hope you will consider using this for some of your gifts this year! There is an order form here, or of course you can just write or call me with your request. Here in Japan we recently see many advertisements for products designed to erase odors; "Take these pills regularly and you will smell like roses," one says. Well, try it if you like. Another ad says "Take this pill after eating garlic dishes, and the lingering odor will disappear!" Well, that one might be convenient. But where shall we end up if this sort of thing continues? Just the other day, I saw another such commercial; all of a sudden the entire screen was covered with a dramatization of family members spraying a deodorizer all over their house. "Did you grill meat this evening?" Pssssst ... ... "Are guests coming soon?" Pssssst ... ... "Father is home!" Rush to the entranceway and Pssssst ... ... all over his jacket. Now it is true that wool products do readily absorb tobacco smells, but the next scene astonished me. A few women who were visiting a friend's home sniffed the air gingerly, and then chorused in admiration, "This house doesn't smell at all!" While I watched this, I could imagine the spray erasing all the nice warm family smells along with the unwanted ones, and felt as though I myself could be erased! Speaking of such smells, I can't forget an episode from over 30 years ago which made a strong impact on me; it was a scene from an occasional TV drama on NHK, entitled 'Overseas Drama Episodes'. The main character in one of the episodes was a very old woman living in an old folks home, who habitually kept a candy in her mouth. When she was asked why she did this, she replied "My grandchildren complained that my mouth was smelly ..."
I admit that I wouldn't have been able to properly understand her feelings, as I was only in my late 20s then, but I felt shocked at her behaviour and almost cried at the TV set, "Stop doing that! You will ruin your teeth and make the problem worse!" Now though, I am approaching her age, and perhaps this might be a reason that I over-react to these TV commercials for covering up bad smells with sprays. Although I am worried by this idea of sanitizing our environment, I can now more readily sympathize with her concerns. When I was a child I loved my father's smell - a mix of tobacco and hair lotion. I never thought he smelled bad, but rather felt a protective feeling from his odors. And when I picked up my mother's scarf from her dresser and draped it around my neck, her sweet odor wafted about and wrapped me with gentleness. Sitting with my grandmother in the warm winter sunshine I enjoyed the mixed scents of wool and soap (from her apron), scents that for me will always typify her. I wonder how children who are growing up surrounded by odor-killing products could ever enjoy such feelings? Isn't it a bit sad? Do I hear somebody asking, "Do you like David's smells?" Well let me answer this question by passing on a comment he made to me the other day, "I am absolutely clean! I make sure I get my body clean too, every time I shampoo my hair!" Gallery Talk: Sunday January 20, 2:00 p.m.